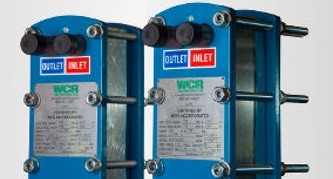 WCR has grown to develop our own line of WCR-branded Heat Exchangers that directly compete with original manufacturers. WCR harvested the knowledge of over 30 years in the industry to create products that surpass the competition in quality and customer service. WCR engineers custom heat exchanger solutions to optimize heat transfer performance. Heat Exchanger Plates - WCR heat exchanger plates are designed to be direct replacements for all OEM model plate heat exchangers. We've reverse engineered the exact plate specifications to maintain nameplate performance for any plate heat exchanger. Heat Exchanger Gaskets - All gasketed plate heat exchangers require maintenance at some point in their lifetime. Gaskets should be replaced periodically to maintain function and avoid unnecessary shutdowns.